I think that our readers might be interested to know about a fraud that is common and appears to go unnoticed by many experts in auction houses and elsewhere. It is all too easy to obtain a mid 18th century teaspoon through the internet or even in a junk shop for about �.00 or �.00 and then, for very little effort, turn this investment into �0.00 or �0.00 by reshaping the handle and piercing a few holes in the bowl. Thus creating a mote spoon. The main feature to look for in this particular fraud is "length and shape". The original name for the mote spoon was 慙ong or Tea Strainer Spoon� (the term 慚ote Spoon� was coined in the 19th century) and the important word in this description is 慙ong�! 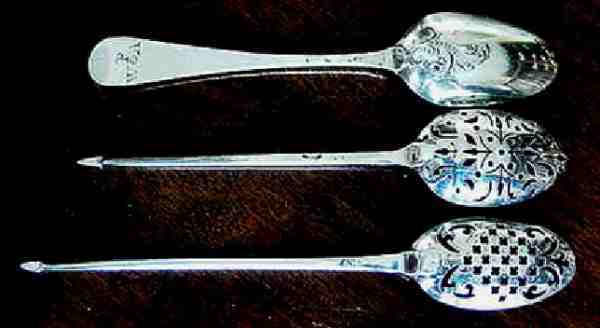 Even though mote spoons did get shorter as the 18th century progressed they did not become as short as teaspoons. The upper spoon in the illustration is a mid 18th century fancy back teaspoon and the spoon immediately below it is the same size and is a fake mote spoon. The lower spoon is a genuine mid 18th century mote spoon and I have chosen the shortest in my collection to illustrate that even this is noticeably longer than the fake. 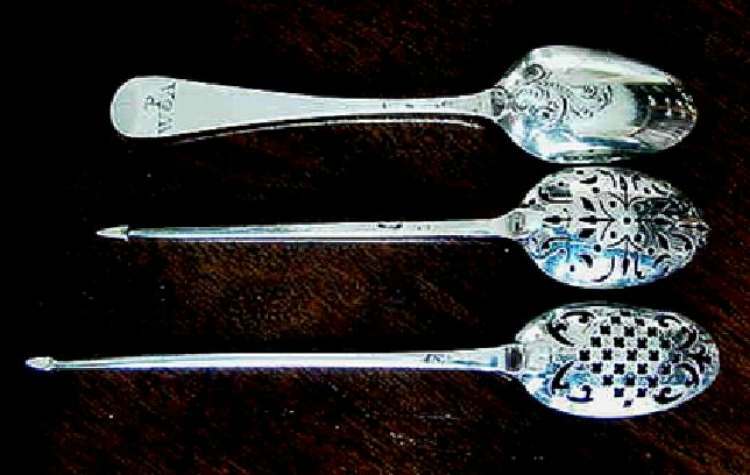 The other features to look out for are the shape of the bowl ( mote spoons usually have longer and narrower bowls than teaspoons) and the piercing (the common feature in most mote spoons is that from about 1735 onwards the piercer used crosslets as well as other fretwork and simple holes are not common at this date). These are not foolproof features but taken together with the overall length of the spoon can be a good guide. It would be misleading if I did not mention that there are genuine miniature mote spoons of the mid 18th century but these are, as will be seen in the illustration, appreciably smaller than teaspoons. These are believed not to be toys (in the modern sense) but no explanation for them has yet been suggested. In this connection no substantiated suggestion for the use of the full sized mote spoon has yet been put forward. It is likely that they were not for skimming 憁otes� from the top of the tea in a cup since, by experiment, the piercing proves to be much too large for this! Notwithstanding the foregoing it must be said that there are occasions when it is very difficult to determine the authenticity of a mote spoon and, I am afraid, I have no advice to cover such occasions. My last illustration is of a 慺ancy front� mote spoon and this alone is unusual. The overall length of this spoon is the same as that of the genuine mote spoon illustrated above but the marks, the sterling lion and the maker抯 mark, would suggest a mid 18th century date for its manufacture whilst the piercing is, as stated above, unusual for such a date. Although the shape of the bowl is more mote spoon than tea spoon the spike at the finial end of the stem is unusual to the extent that it may even be unique. The 憊ase of flowers� decoration in the bowl has been engraved rather than die struck and this feature is also very unusual. For all these reasons this spoon was condemned by experts at a meeting of The Silver Spoon Club whilst the expert at The Victoria and Albert Museum (V & A) considered it a 慻ood� spoon. I illustrate and describe this spoon to show how difficult it can be to determine whether or not such a spoon is genuine when there is a mixture of 慻ood� and 慴ad� features. However, on the whole, the guidelines laid out above will serve in most cases.